Staff - your project team, the whole department, freelancers etc. Machinery - production lines, vehicles or even laptops. Rooms - meeting rooms, conference rooms, office spaces etc. Resource planning done right will improve project progress as well as the motivation and engagement of your team. To do it right, you need to have an overview. To get that overview, you need different views of your general resource plan. Hundreds and maybe even thousands of resources all in one list isn’t a way to go. If you are wondering what are the best practices for resource scheduling using different views, you have come to the right place. In Ganttic, a view is essentially your resource plan. If Ganttic is not your resource planning tool, and you are using an Excel template for resource planning, the template is a view. It has various properties like the length of the time period, the number of resources you see and the colors of the Gantt charts. 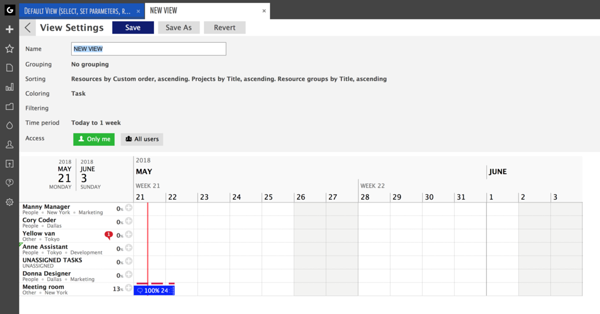 If you change the time period of your resource plan from a week to a month, the resource plan looks like a whole new thing, right? That's the beauty of views. You'll see things differently. However, changing the parameters of an Excel resource planning template is a hustle. Using views when planning with a resource planning tool is a habit worth forming. General resource view is where it all begins. It’s a view without any grouping, filters or coloring. Just a plain view of how things are. A view of how things are does kind of sounds good, doesn’t it? Why should you change anything? 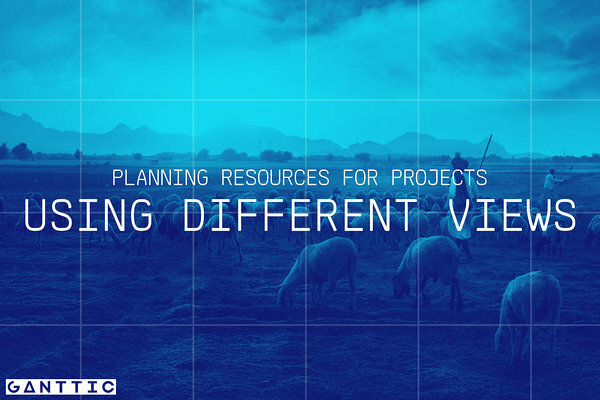 Creating different views will allow you to do more thorough resource planning. You can only view the details or the big picture. You’ll actually get a control over what’s going on. The need to use different views grows as the number of resources you have grow. Custom views are modifications of the general resource view. How to do those modifications and how to use them to your advantage is what this article is about. Project views are custom views with a hint of general resource view. If you plan a task in a project view, it will be automatically connected to that project. The tasks that have been allocated to the resource but are part of another project, are grayed out. The default coloring is by project colors and the default time period is the duration of the project. You can modify all of the view settings. The only thing is, you can’t save different versions of the project view. You can have different settings for each individual project but you can’t create different versions of one project. The list of views is the list of views you have created. You can access it through the sidebar. You can add new views from there, you can open views up and you can delete views you have created. As it is with everything else in Ganttic, planning using different views starts from your data and the way you have set it up. And as you already probably guessed, it has a lot to do with your custom data fields. List all the different views of your general resource plan that you might need. Perhaps you are a department manager? Perhaps you have different kinds of resources? Perhaps your team consists of individuals with different skills. Perhaps you have freelancers? Anything that comes to mind, write it down. To create views of those needs, you must enter that data to Ganttic. You can add parts of that information to resources, part of it to tasks and part of it to projects. List type custom data fields? Add them! List type custom data fields are the data fields with a list of values. To add a list type custom data fields you have to add a name to it (Location) and then add the values (Madrid, London, New York etc). After you have added the data field, you can select a value for the specific resource, project or a task from a list. List type custom data fields are used for grouping and coloring. They can also be used for filtering. Add the information about the resources to the resource dialog. That can be information about resource type (i.e. if it’s your staff, a piece of machinery or a room etc). It can be information about the department the resource works in. Or in which office the resource is located. The data you can use for grouping resources. One resource can be in several resource groups. List type custom data fields in tasks can be used as an indicator of task progress or any other kind of task data that you’d like to color code. It’s the same with projects. Any other kind of custom data? Add it! We weren’t kidding when we said you should really map out your needs. Any data you have added can be used for creating views. You can filter stuff out using text type custom data fields. You can sort projects by a certain milestone. 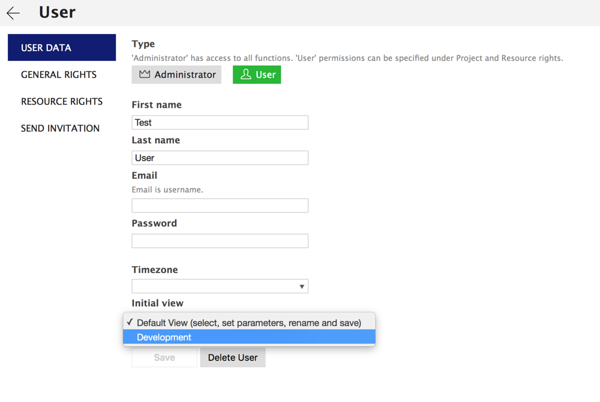 You can filter out all of the projects that a certain project manager is working on if you have added user type custom data field like that to your projects. The good thing is, you can always add new custom data fields. Nothing is broken if you can’t come up with everything you might once need right now. To create a custom view, you can open up any of the views that you already have or select ‘ADD NEW’ from the list of views. The easiest example is a view for a department. Start by filtering out the department. Then, let’s say you want the resources to be grouped by their skills and you have a list type custom data field with the information. Select the grouping. Let’s say you want the resources to be sorted in those groups in the way that the resources with the biggest utilization percentage would be at the bottom of the group. Go to sorting, select utilization, and make sure that the arrow is pointing down. You might want the Gantt charts to be colored by project colors so that you’d know which projects your department is working on. Select coloring, and project colors. Click on ‘Apply’. The last thing is the time period. You can create a custom time period that fits your planning needs or choose one from the list. As you can see, the schedule looks quite different from the general resource view. That’s because you have created a custom view. All that is left to do is to save it! If you are just starting off with your Ganttic journey, you might find it helpful to know that you can set a default view for a user. For example, if you are adding someone that is a part of the department you created a view for, you can set the view as their default view and they’ll see it as they log in. Another thing about the views is that you can create views that are meant for your eyes only and views that the whole team can see (that’s when you’re an administrator). Everyone can create private views. For example, if someone on your team just wants to know their own tasks and maybe the tasks of Leonard and Katherine, they can filter these resources out and save the view with the filters. Or maybe you want a view with different coloring through some custom data field that is only relevant to you. Since changing the coloring can be somewhat confusing to the team, you can create a private view. If you are an administrator, you just need to make sure you have selected ‘Only me’ as the access setting. Public views are visible to everyone. If you create a public view, it will appear in the list of views of every user and administrator. They can open it. They can use it. Administrators can also edit the settings of any public view, users can't. You can create specific views for departments, for teams, for locations etc. If your whole organization is using Ganttic as their resource planning software, these kinds of views are essential since they divide the general resource plan into manageable bits. And there’s always the option to go back to general resource view to see how things go together. Selecting a time period for a view can be somewhat tricky. When planning resources for projects, it’s important to know the short-term as well as the long-term workload of your staff. You also need to know when the machinery is being used and when it’s free. You also need to know when the rooms are booked etc. The time period of the view is the last setting that you can choose for a view. If you want to create a view with a specific time period select that time period, choose the other settings that you’d like to be applied to the view. Go back to ‘View’ and select ‘Save as’ and you’ll have a new view that you can give a name to. Having an overview of what’s going on in the short-term is important for your team as well as for you as a team leader. It’s about optimizing and reallocating. It’s about changing the task statuses and seeing what’s next on the schedule. Short-term views are what your team should keep their eyes on. Visual long-term plans are good for sales and forecasting. 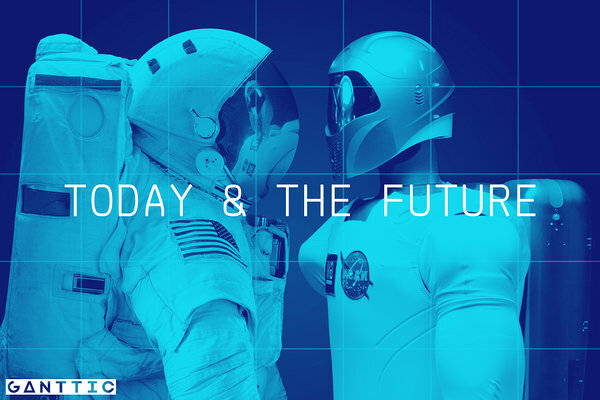 It isn’t about the now, it’s about the future. It’s just booking and making sure you have enough resources. It’s the view that’s a good fit for the upper management. Our recommendation here is to create three general resource views with different time periods. One that shows you the schedule for this week and the next week. One that shows you the schedule from today and ends with the next month. And the last one should be even longer than that depending on how plans are made in your organization. The first two are the most popular options among our clients. Using both of them will give you a manageable picture of what’s going on. You’ll know what’s going on in the near future. 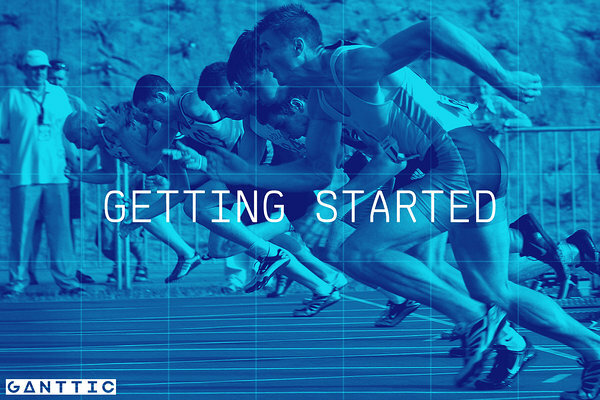 You’ll know if you can take on new projects. You can reallocate resources and fix problems before you actually encounter them. The third and the longest time period gives you that extra oomph as a project manager. It definitely isn’t about the details. Group your resources using the projects that their tasks are a part of and turn the utilization graphs on. That way you’ll know when it's the busiest in the long run. That view you can also recommend to the sales team. If you have any further questions or need personal recommendations, contact our support team!